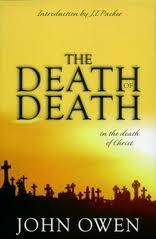 If you’ve never read JI Packer’s introduction to the John Owen’s classic book the Death of Death in the Death of Christ you must invest the time in it. The book is long and dense, but the introduction is a classic unto itself because of it’s ability to boil the issues down to their essence and crisply communicate them. Without realizing it, we have during the past century bartered that gospel for a substitute product which, though it looks similar enough in points of detail, is as a whole a decidedly different thing. Hence our troubles; for the substitute product does not answer the ends for which the authentic gospel has in past days proved itself so mighty. The new gospel conspicuously fails to produce deep reverence, deep repentance, deep humility, a spirit of worship, a concern for the church. Why? We would suggest that the reason lies in its own character and content. It fails to make men God–centered in their thoughts and God–fearing in their hearts because this is not primarily what it is trying to do. One way of stating the difference between it and the old gospel is to say that it is too exclusively concerned to be “helpful” to man––to bring peace, comfort, happiness, satisfaction––and too little concerned to glorify God. The old gospel was “helpful,” too––more so, indeed, than is the new––but (so to speak) incidentally, for its first concern was always to give glory to God. It was always and essentially a proclamation of Divine sovereignty in mercy and judgment, a summons to bow down and worship the mighty Lord on Whom man depends for all good, both in nature and in grace. Its center of reference was unambiguously God. But in the new gospel the center of reference is man. This is just to say that the old gospel was religious in a way that the new gospel is not. Whereas the chief aim of the old was to teach men to worship God, the concern of the new seems limited to making them feel better. The subject of the old gospel was God and His ways with men; the subject of the new is man and the help God gives him. There is a world of difference. The whole perspective and emphasis of gospel preaching has changed. The preacher’s task, in other words, is to display Christ: to explain man’s need of Him, His sufficiency to save, and His offer of Himself in the promises as Saviour to all who truly turn to Him; and to show as fully and plainly as he can how these truths apply to the congregation before him. To the question: what must I do to be saved? the old gospel replies: believe on the Lord Jesus Christ. To the further question: what does it mean to believe on the Lord Jesus Christ? its reply is: it means knowing oneself to be a sinner, and Christ to have died for sinners; abandoning all self–righteousness and self–confidence, and casting oneself wholly upon Him for pardon and peace; and exchanging one’s natural enmity and rebellion against God for a spirit of grateful submission to the will of Christ through the renewing of one’s heart by the Holy Ghost. And to the further question still: how am I to go about believing on Christ and repenting, if I have no natural ability to do these things? it answers: look to Christ, speak to Christ, cry to Christ, just as you are; confess your sin, your impenitence, your unbelief, and cast yourself on His mercy; ask Him to give you a new heart, working in you true repentance and firm faith; ask Him to take away your evil heart of unbelief and to write His law within you, that you may never henceforth stray from Him. Turn to Him and trust Him as best you can, and pray for grace to turn and trust more thoroughly; use the means of grace expectantly, looking to Christ to draw near to you as you seek to draw near to Him; watch, pray, read and hear God’s Word, worship and commune with God’s people, and so continue till you know in yourself beyond doubt that you are indeed a changed being, a penitent believer, and the new heart which you desired has been put within you. The preaching of the new gospel is often described as the task of “bringing men to Christ”––as if only men move, while Christ stands still. But the task of preaching the old gospel could more properly be described as bringing Christ to men, for those who preach it know that as they do their work of setting Christ before men’s eyes, the mighty Saviour Whom they proclaim is busy doing His work through their words, visiting sinners with salvation, awakening them to faith, drawing them in mercy to Himself. This entry was posted in Theology and tagged John Owen atonement, John Owen book, Packer introduction, Packer particular atonement. Bookmark the permalink.